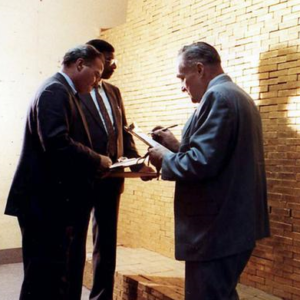 The PAMP 1 gram gold bar is a 99.99% purity gold bar minted in Switzerland. PAMP, based in the Swiss Canton of Ticino, is one of the world’s best known and prestigious gold refineries, so when you buy PAMP gold bars, you can be assured of their pedigree. The front of the 1 gram PAMP gold bar features a representation of Lady Fortuna, the Roman goddess of good fortune, who is depicted with symbols of prosperity, overflowing with gold coins. 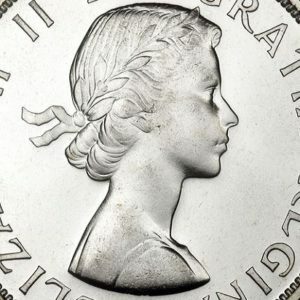 PAMP also produces various other editions of minted gold bars which feature a ‘Rose’ design, and a ‘Liberty’ design depicting the Statue of Liberty. The reverse of all 1 gram PAMP gold bars display PAMP’s well-known logo of 4 circles, the bar’s weight and purity “SUISSE 1g FINE GOLD 999.9”, and the official Swiss stamp of authenticity “Essayeur Fondeur”. The 1 gram PAMP gold bar is 14.7 mm long, 8.9 mm wide, and has a thickness of 0.43 mm. 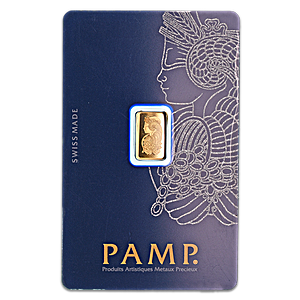 Every 1 gram PAMP gold bar comes presented in its own distinctive security CertiPAMP packaging which also displays the gold bar’s unique 7 digit Certificate Number, the weight and fineness of the bar, and the signature of PAMP’s Certified Assayer. PAMP is an abbreviation for the French “Produits Artistiques Métaux Précieux”, or “Precious Metals Artistic Products” in English.